As Andy and Kate were already abroad, only one full car was waiting for the 6:00am ferry at Dover this year. After a large English breakfast onboard, we were in Dunkerque by 8:45 and into Belgium by 9:30. Once around Brussels we stopped for a coffee at the Barchon Services (almost a tradition now) and then headed off into Germany. Once there the roadworks were terrible and for a while continuous. Time was slipping, and even the German attitude to speed limits was not going to help make up time. We stopped for lunch above the Mosel and after a slight detour via Nürnberg (apologies, I was asleep) we were past München and into Austria. It was soon obvious that we were not going to make Hinterbichl that evening, so we looked for a guesthouse in the town of Mittersil. Teutonic efficiency meant this was easy, even at 9:00pm and we were soon in the Gasthof Haidbach having a wash in preparation for hitting the town. Pizza and a few beers later we were all tucked up in bed, sound asleep. Up early and breakfasted, we set off to do the last few miles to Hinterbichl. Barbara, the woman who runs the hut we were to be staying in, called and invited us for coffee at her house. So we called in and watched the world go by over coffee and tea, whilst chatting and trying to stop Peter, Barbara’s 18 month old son, from drinking and spilling the coffees. But we had mountains to conquer, so we left and parked the car at Hinterbichl. Leaving a car on the side of the road for a week is possibly not to be advised in the UK, but fine in Austria. The walk to the Johannis Hut is a 3 hour plod mostly along a gravel track, but there is a convenient 4wd minibus service to take you all the way. At 10€ per person for a 10 minute ride it is not cheap, but having done the walk several years ago I can confidently say it is worth it. Our original plan had been to stay here on Saturday night – the Johannis Hut was originally built in the 1850s making it one of the oldest huts in the Alps. Modernisation a few years back has robbed it of some of its charm, but it remains a venerable hut. 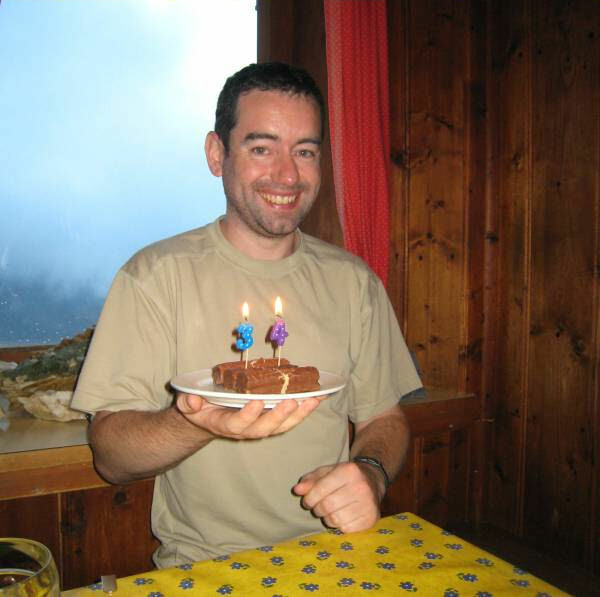 We had another beer (good thing, these mountain huts) and a bowl of soup and then left the warmth of the hut for the overcast afternoon outside, ready and primed for the 850m ascent to the Defreggerhaus. Having everything for the week on our backs we decided to use the cable car. Whilst people cannot ride in it rucksacks can, for a small charge. So, with a spring in our step we climbed to the hut unburdened in a leisurely 2-3hrs. The hut is in a fine position at 2962m, quaint inside with much panelling, and small cosy rooms on the first floor. We had dinner and were in bed early (well, there is not much to do once the sun goes down). We were up late. It was 7:30 when we went down for breakfast, the last in the hut to do so. But there was no rush. By 9.00 we were kitted up and ready for a day in the mountains. 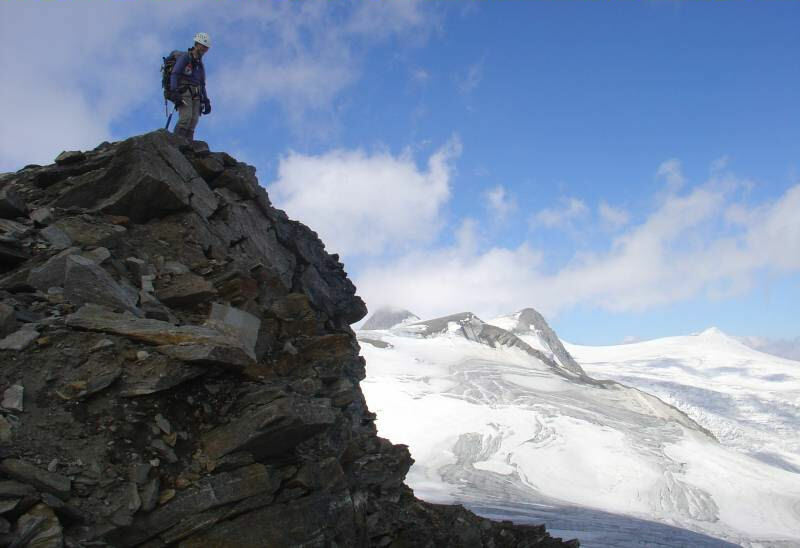 The plan was to head onto the Mullwitz Glacier and up to the Hoher Zaun. 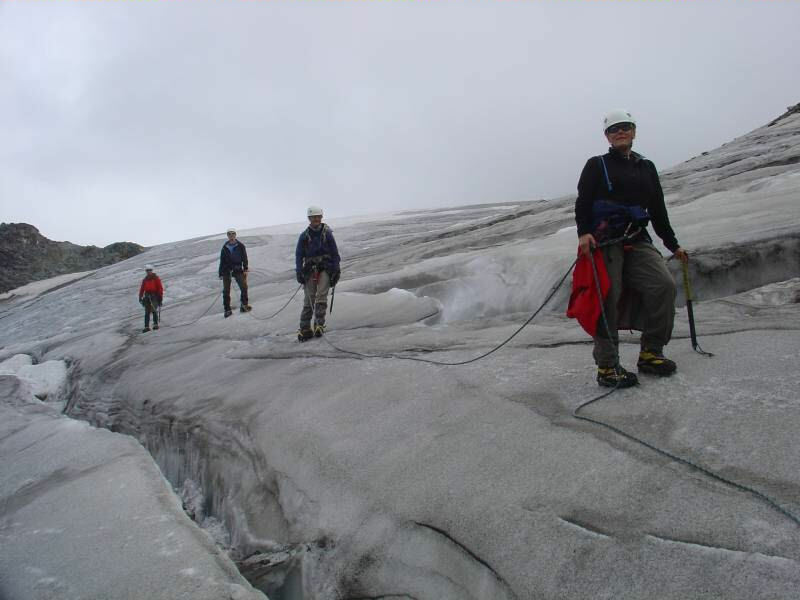 We roped up at the top of a rocky rib of rock called the Mullwitz Adler and set off on the glacier. Although late in the season, the ice was covered with snow making progress a little slow. 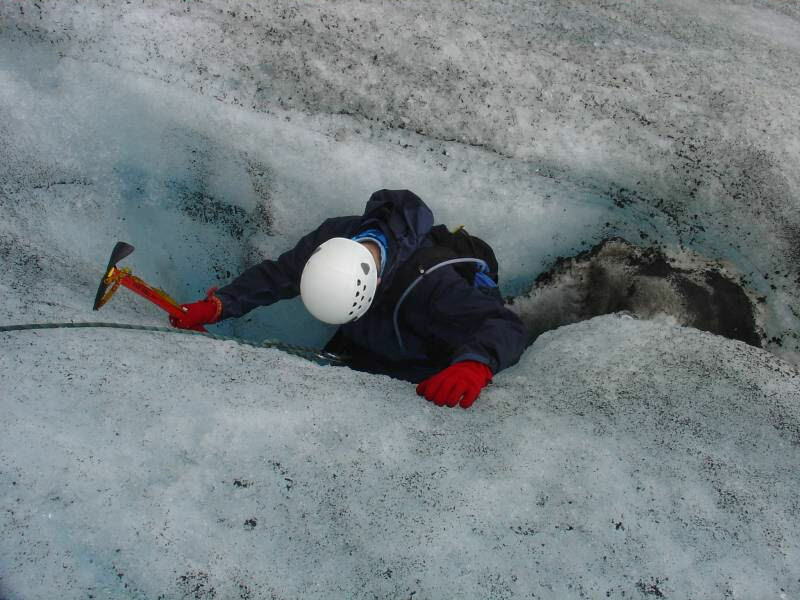 A large crevasse had appeared in the glacier, meaning we needed to make a slight detour around it. 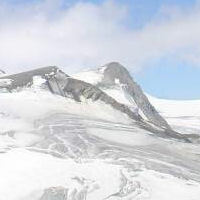 The summit of the Hoher Zaun is a fine viewpoint, the mountain an easy dome on the one side but a steep jumble of rock and ice on the other. We were able to see the Neue Prager Hutte away in the distance and had a good view of the surrounding peaks. As Andy was not with us we decided not to do too many peaks without him, so it was an easy decision to return to the hut for a beer. Or two. After dinner we went out onto the ridge behind the hut and spotted a figure, the last to be doing so, making its way to the hut. As we watched it became clear that it was Andy. 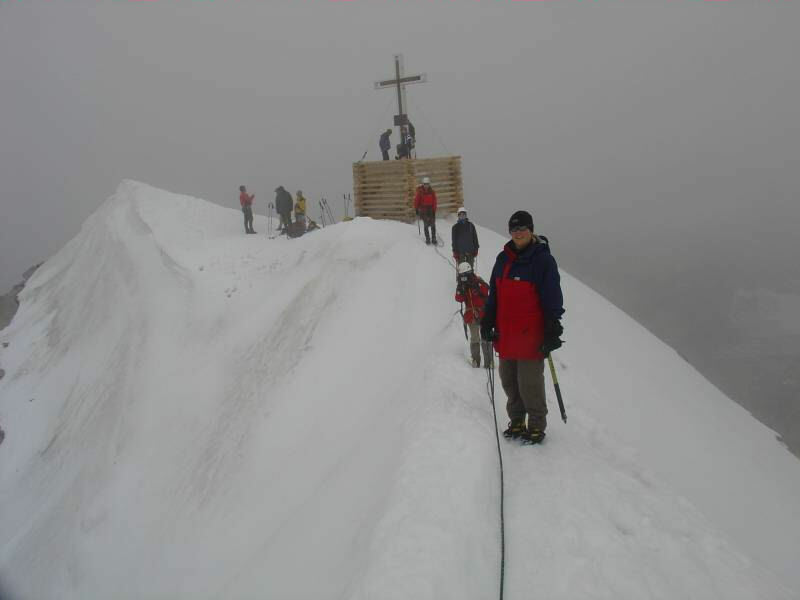 Up a little earlier today and a more challenging target – the Weißspitze. 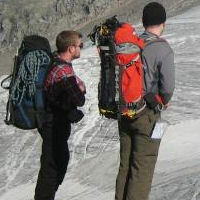 This would mean a loop traverse on the Mullwitz Glacier, steep climb to a col and then a scramble to the top. According to Barbara the route had not been done much this year due to poor snowfall making the climb to the col particularly tricky. Still, to quote Hans-Ulrich Rudel – ‘Verloren ist nur, wer sich selbst aufgibt’1. The initial trek over the glacier was easy. The route went over the lower part of the glacier which was free from ice and only at a slight angle making the chance of a crevasse low. We crossed a rocky outcrop and gained a little height before dropping back onto the ice to begin the last part of the loop around to the col. A large amount of stonefall onto the ice meant we had to lose some height and the steepness of the ice meant crevasses were more frequent, requiring numerous zig zags. Resting on some boulders, the way to the col looked steep, but do-able. There was a bergschrund to be crossed but it did not look too wide. 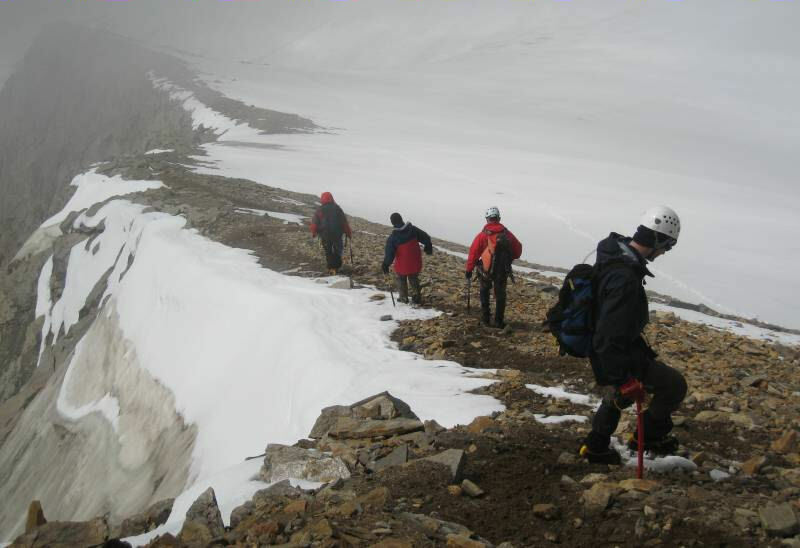 So we climbed up to below the col, which normally, when there is enough snow is about 30m higher than the top of the glacier up a steep gully. 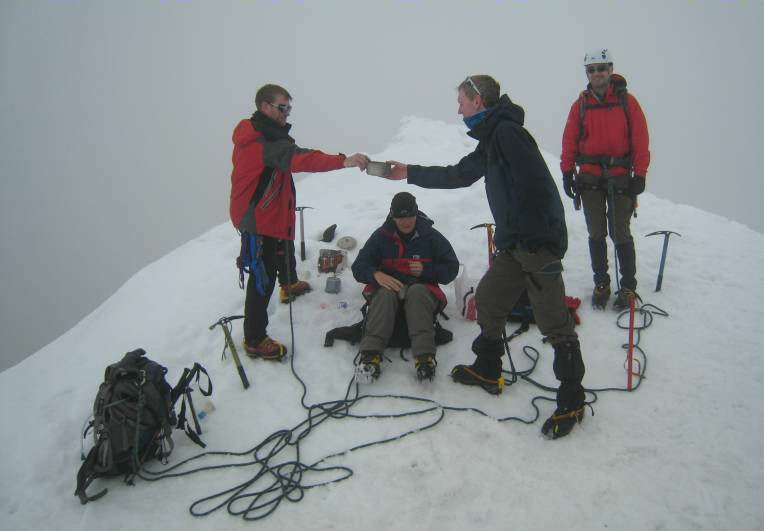 This year the col was 70m higher and the extra height made up of ice with a thin covering of pulverised rock and grit. At a 50° angle just to make it more interesting. Undeterred, we crossed the bergschrund and using ice axes scrambled up to the bottom of the gully. Here the going was off the ice, but steeper and requiring care. We gained the col which is a much easier proposition on the east side and were afforded views towards the Eisee and Eicham. Bruce decided to wait at the col whilst the rest of us headed for the Summit. The cloud was down, so views were not going to be good. 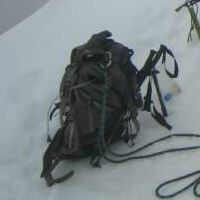 Beckie decided that bagging summits for the sake of it was not her thing, so went back halfway up to join Bruce. So it was that three of us stood on the top, wishing for views (which are superb). But the day was only half over. We had to return the way we had come. This meant descending the 50° ice slope. The top bit was not too bad, but the last 5m, above the cold maw of the bergschrund was a more tricky proposition. 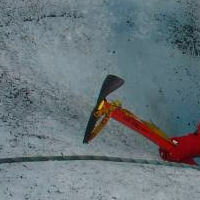 Having quite a lot of gear between us we decided to belay the last section from a pair of ice screws. It was good practice. All of us below the gap we headed back taking a more direct route over the ice to arrive back at the hut, sound in the knowledge – Venit, vidit, vicit. The weather today was forecast as being very good. The hut had filled up on Tuesday afternoon as the climb of the Venediger is a popular 2 day outing for Austrians and Germans (the Venediger can be seen from Munich). We were up at 6:00am, several parties had been up earlier, but many were still in bed. We ate a quick breakfast and headed off for the hills. 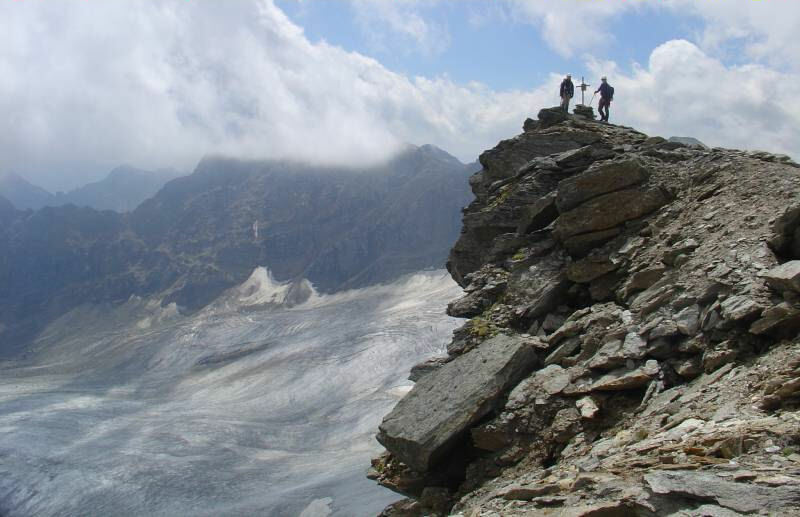 The voie normal on the Venediger is a climb done by many thousands each season, meaning the route is well worn and easy to follow. At the roping up point there were already 20-30 people in various groups on the ice. It was going to be a busy day. Despite the forecast, the top was shrouded in mist and fog. We plodded along on the ice and snow going at the same pace of the other groups, occasionally overtaking and being overtaken. 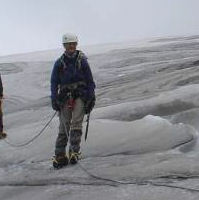 There is a steep section below the Rainerhorn which is crevassed, but other than this the route is without technical difficulty. After yesterday’s exploits, anything was possible for the NMC. 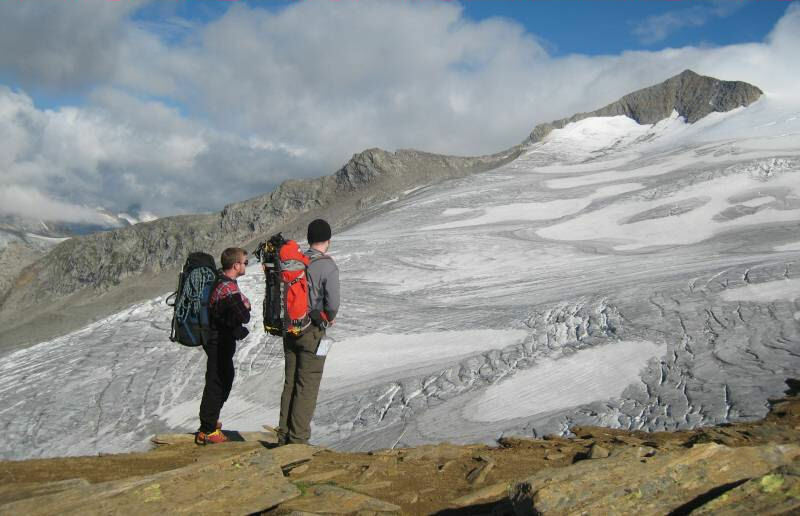 At 3400m the Glacier flattens out to a plateau with the final 250m climb half a mile away over the ice. Groups from two other huts converge here, making it even busier. 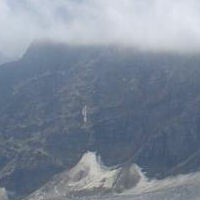 The last 50m to the top is a fine narrow crest leading to the large summit cross. 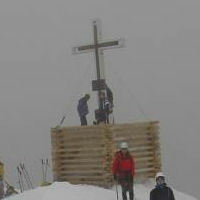 (Only the summit of the Gross Geiger and Rainerhorn seem to be without a large cross in the immediate area.) We crossed this, glad the wind was not too bad (it is a real ‘if I fall into France, you jump into Italy’ snow crest) and made the top. At 3667m this is possibly the highest point reached on a club trip. In old money the height is 12030ft. We had a brew, stove fiercely roaring away whilst we (and the other 15 or so on the top) milled about and wished for a better view. After 30 minutes we decided to head back, but as the weather was still good we could not pass up the chance of climbing the Rainerhorn. It lies only a short distance from the main Venediger route and is a fine tooth shaped mountain, its central position in the range making it a good all round viewpoint. From the top we retraced our steps to the main trail over the glacier and romped back to the Rocky ridge above the hut. Here we stopped and enjoyed the view of the mountains we had climbed. Back at the hut we ate dinner, Bruce lit the little cast iron stove in our room and we watched the sun set over the mountains – climb the mountains and get their good tidings2. Only Pam, Andy and I were up early today as Bruce decided as it was his birthday he was having a day off and Beckie was giving her heels a day off – her new boots having given her a blister or two. Today’s objective was the Kristalwand, from the north a soaring 3000ft wall, nicknamed the Eiger by the locals and the Direttissima the hardest rock route in the area (first climbed in 1933 and little repeated). Our route was from the south, over the glacier and a much gentler proposition. The first part of the route was as Tuesday, but once on the first rocky section we trended north up very steep ice to gain the upper part of the glacier. From then on it was a straightforward glacial route, although open crevasses meant we spent some time threading our way along. There is a ridge here which although shallow on the right is steep on the left side and traversing along this, although some way from the edge we approached the summit of the Kristalwand. It has two crosses and is a remote and little traversed peak. The view from the top over the north face is quite spectacular and owing to the loose and rotten rock, somewhat dangerous to view. No wonder the route up the face is seldom repeated. 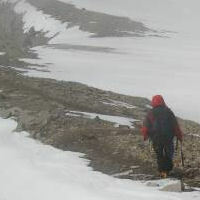 We could have descended to the Badner Hut and called in on Eric, but the weather was unsettled. We ate lunch and with the words of Uncle Monty in our minds – “Come on lads, let’s get home, the sky’s beginning to bruise, night must fall and we shall be forced to camp” we began to head back. The steep descent to the rocks was not as hard as we were expecting, crampons working well and biting into the bare ice, so we stopped and looked a while at the view, the clouds and the glacier. Back at the hut Bruce regaled us with his epic day down at the snout of the glacier evading quicksands and wondering if glacier caving was a wise idea. Beckie had made the most of the sun reading and chatting to Barbara on the benches outside the hut. 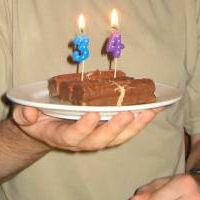 We had a few beers, watched the weather get steadily worse and celebrated Bruce’s birthday (his 3rd in Austria). The weather was bad when we got up. There were only a handful of people in the hut so we had a late breakfast, paid the bill (190€ each for 4 of us and 160€ for Andy – for 5 days in the hut including all food and drinks) and after a long goodbye we headed off for the Johannis Hut. Kate arrived up from Hinterbichl in the valley so we had lunch together before waiting in the light rain for the 4wd minibus. Pam decided to walk down and with perfect timing arrived at the trail head after a 6km descent just as we arrived in the minibus. Andy and Kate headed back to their car and Bruce, Pam, Beckie and I headed off for Lermoos on the German border, just south of Füssen. It claims to be one of the best mountain bike areas in the Alps with many miles of trails – possibly worth a visit one year. We stayed in another fine guesthouse for 25€ each and had a good inexpensive dinner. Saturday was an 8-hour drive across Germany and into Belguim where we decided to stop at Aalst, a few miles north-west of Brussels. At first it looked like a pretty dismal industrial backwater, but after we actually found the centre it turned out to be a pretty cobbled town with some fine architecture and fine cuisine. We stayed in an accommodating hotel who went to the trouble of getting extra beds (although the lack of a door on the toilet in the room Pam and Bruce were sharing must have made for an interesting night). The following morning we were back at the ferry and home for lunch.